We're Now In Our 2008/9 Winter Home! Finally, we got back on the road late Thursday after leaving Fyda Freightliner in Barkeyville PA (off I81 just east of I79). If you ever need service on your motorhome, I recommend this establishment - they're friendly, competent and reasonable. We spent the night on Thursday in Summersville WV in a Wal*Mart parking lot and another night as guests of Sam Walton on Friday night in Brunswick GA. We also met up and had refreshments with friends from Cambridge who are staying on Jekyll Island in GA for a couple of months (and happen to have exactly the same motorhome that we have). Then Saturday morning we were off to Nettles Island in Jensen Beach FL, our home for the winter. 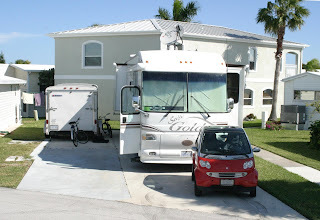 We unloaded the trailer of its vehicles (motorcycle, Smart car) and put it all in place. Picture attached above! Now to relax for the rest of the day. Time enough during the week to clean up and put everything away. A Rough Start! Not so "Smooth"
Well, we did get off to a great start on Saturday morning after a hard week of packing and moving out of our townhouse in Guelph ON. The crossing into New York State at Fort Erie / Buffalo was fast and civilized and we got a great start until problems hit us on I79 at Meadville in PA.
We lost the fan belt on the engine (this is the "serpentine" belt for those of you savvy in these things). After getting a mobile mechanic to install a new belt, we found that the real problem was a faulty fan hub; the bearing seized, causing the serpentine belt to break. Probably a good thing, because a complete failure of the fan hub could have resulted in the hub flying through the radiator or, worse, through the bed and into the motor home. The mobile mechanic removed the faulty hub and installed a short belt so that the alternator and water pump still worked. But now the engine coolant wasn't being cooled and the charge air cooler wasn't working either. That meant the intake air from the turbo wasn't being cooled and the radiator couldn't do its job either. After running for about 10 minutes down the road, the intake air was too hot and the engine started to overheat. Ugly! But it got the RV off the Interstate and into the parking lot across from the motel where we stayed that night. That parking lot turned out to be for an Auto Zone store that also happened to have an automotive electric fan that fastened onto the radiator. With some extra work (wiring, switch, fuse, fasteners - I felt like McGyver! ), the fan was operating as a small shadow of the original. But at least it provided some cooling! On Sunday afternoon, I limped 50 miles to the closest Freightliner dealer to have the repairs made. With the waiting for parts and the work to be done, I lost another 3 days. I hope to be on the road to Louisiana by Thursday and continue my travels to our Florida wintering spot at Jensen Beach on the Atlantic Ocean. Hopefully, the next entry will be more upbeat! Onwards!